Wherever you go... pack a fun and functional backpack from Simply Bags. Unique designs, animal prints, damask, paisley, appliqu�' and so much more. 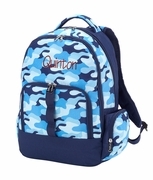 Backpacks are perfect for adults and young people on the go. Inside and outside pockets for books, cell phone, travel necessities, and water bottles. Everything needed for a day travelling, around campus and for our youth, trips camping and overnight to grandma's. 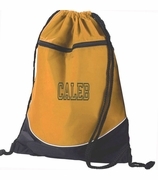 Add embroidery with name, single or three letter monogram for a keepsake personalized gift. 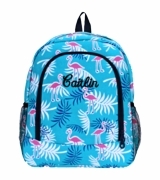 If there is one type of bag that will take you absolutely everywhere you need to go, it�s the humble backpack. A backpack can take your child to school, see you through a day of hiking in the mountains, or help get you home from the grocery store on your bicycle. The fashion world is constantly telling us that the backpack is back in vogue once again, but we like to think that it never actually left. 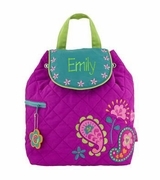 At Simply Bags, we carry a wide variety of backpacks that are as fun as they are functional. 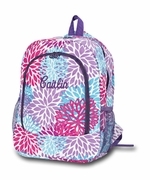 Our designs are unique, and at Simply Bags, you will truly find something for everyone; from our children�s backpacks to our more robust designs, we cover a wide range of options for all active people on the go. 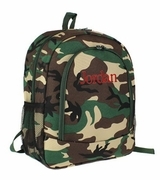 All of our backpacks have multiple places for storage, including inside and outside pockets for books, a cell pone, travel necessities, and water bottles. Many of our more robust backpacks (like the Woods and Camo Cinch backpacks) are made form a washable, water-resistant material that makes them ideal for hunters, hikers, or anyone else that likes to get out into the great outdoors. 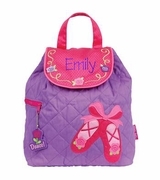 Our children�s backpacks (Boys�, Girls�, Dance, and Gymnastics backpacks, to name a few) are a fun and cheerful way for your child to express themselves while en route to their lessons. 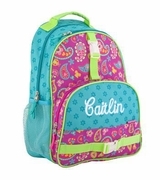 All of our Simply Bags backpacks can be embroidered with a name or a single or three-letter monogram, and make excellent gifts for students. At Simply bags, we believe that personalization significantly cuts-down on the confusion generated in crowded lecture halls and coat rooms when students of any age are asked to check their bags at the door, only to return later to a sea of identical-looking dark-coloured backpacks.